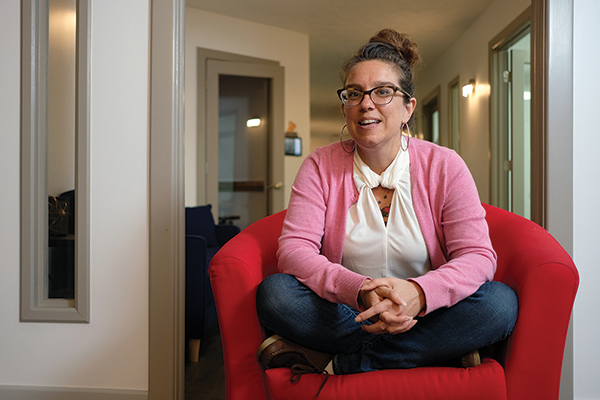 Christina Cain is director of the Staunton Innovation Hub. The entrepreneurial atmosphere at Staunton Innovation Hub is intended to help fledgling companies and nonprofits take shape and grow. Entrepreneurs Peter and Alison Denbigh created Staunton Innovation Hub LLC, which last year purchased the 25,000-square-foot News Leader building and an adjacent 4,300-square-foot structure. The two buildings will create a downtown campus that is being developed in two phases. The first phase of the project, involving the smaller building, opened April 25. “We are a startup so we wanted to start a small version to work any kinks out before we opened the big building,” Cain says. The two buildings eventually will be used as one facility. “We wanted a campus that is inviting for people to visit and useful for people who are living and working downtown,” Cain says. Both buildings will offer co-working spaces as well as offices, conference rooms, event facilities and “gig-speed” internet (download speeds of up to a gigabit-per-second). “All of our co-working and private offices have a month-to-month lease because we want to reduce the barriers to innovation,” Cain says. Construction on phase two will start in late summer. “We have to be finished and be able to move in by June 1, 2019, so Mary Baldwin [University’s MBA program] can move in and start teaching classes in late August,” Cain says. The first tenant in the smaller building, LGBT Tech, is a nonprofit that refurbishes technology for at-risk LGBT teens around the country. “Its founding executive director, Chris Wood, decided the worldwide headquarters needed to be where he and his family live. They could have been anywhere in the country, but they chose to be here,” Cain says.